Let it be no secret that the Dutch are world class promoters of cycling. Not only the Fietsersbond - the Dutch cycling federation - but also cities and towns are constantly promoting cycling as a way of life and a feasible, acceptable form of transport. They do so even though the country enjoys a massive number of daily cyclists. They still produce campaigns that encourage people to cycle. It's much like producing campaigns showing the benefits of snow and ice for the Inuit populations in Canada and Greenland. I never cease to be amazed at how the Dutch do it or the fact that they keep on doing it. And all without fear-mongering, overcomplicating a simple issue or finger-wagging. Here in Denmark, our car-centric Road Safety Council dominates the fear market. In Holland they are selling public health, societal values and everything good about cycling. 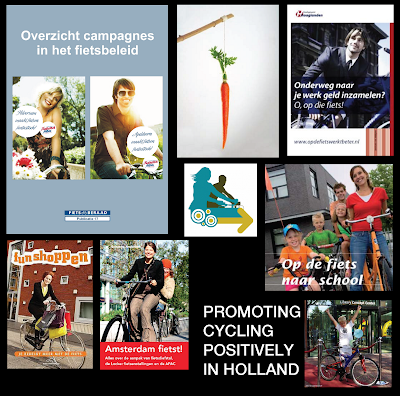 The national Fietsberaad, or Bicycle Council, has produced a pdf document about the variety of pro-cycling campaigns in the country. It's in Dutch, but copy-pasting text into Google Translate enlightens us. There are links in the document to the various websites in question, too. How can the tools of commercial marketing translate to cycling? That question is central to the project MET cycling that Fietsberaad launched in 2008. Although marketing is about much more than just advertising - communication and promotion play an important role. The experience with communication and promotional campaigns in the Netherlands cycling is limited. Usually these are modest campaigns with limited resources. Yet these experiences can also inspire new ideas. Moreover, we need to keep reinventing the wheel to find out. Therefore, the Fietsberaad to XTNT Experts in Traffic and Transport commissioned to make a survey of bicycle campaigns in the recent past. The result is this publication. Modest campaigns. Limited resources. Sounds like issues in most urban centres. And yet the results are positive and the message is clear. Inspiration for any town or city.